Specific means reasons, purpose or benefits of accomplishing the goal. Measurable: - Establish criteria for measuring progress toward the attainment of each goal you set. Describes how each goal will be measured (numeric or descriptive). When you measure your progress, you stay on track, reach your target dates, and experience the exhilaration of achievement that spurs you on to continued the effort required to reach your goal. How will I know when the result has been achieved? How will I verify the achievement/performance of this goal? Attainable:  When you identify a goal, write it out and make a plan, you are making an attainable goal. You will see opportunities arise that will help you in accomplishing this goal. You will develop a positive attitude working towards an attainable goal and you will develop traits that will give you the strength to see it through. Realistic: - To be realistic, a goal must represent an objective toward which you are both willing and able to work. A goal can be both high and realistic; you are the only one who can decide just how high your goal should be. But be sure that every goal represents substantial progress. Timely:  Creates a sense of urgency. Knowing you have to accomplish a task at a certain time makes you accountable. Know what those time lines are. What needs to be done by when. How much needs to be saved by when and take the steps necessary to meet those timelines. Although it was years later that SMART Goals came about, the pioneer in goal setting theory was Edwin A. Locke in the 1960s. He suggested that working toward a goal provided inherent motivation to reach that same goal. He also showed that employees are motivated by a combination of clear goals and specific, helpful, appropriate feedback and there was a positive relationship between clearly identified goals and performance. 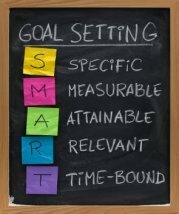 Setting Smart Goals are a goal setting strategy that encompasses the process of planning and working towards your goals. Print a copy of our SMART Goal Setting Worksheet and get started taking the steps necessary to accomplish your goals. you may like these other FREE Goal Setting Worksheets as well! !